Guests will find that many of the major tourist attractions are only a short distance from the Kings Court Prague. They will be able to visit Old Town Square, Charles Bridge, Wenceslas Square, and the Jewish Quarter with just a short walk. Other attractions that they might want to visit include Prague Castle and Powder Tower. The metro station and the tram station are each about 50 meters from the Kings Court Hotel Prague. The train station is only about 250 meters away. Guests will find that many sites are easy to reach on foot. The hotel has 136 rooms. All of the rooms offer high-speed Internet access. The rooms also have air conditioning, safes, mini bars, LCD TVs, iron and ironing boards, and tea and coffee making facilities. The rooms offer private bathrooms as well. 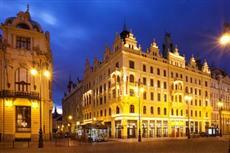 The Kings Court Hotel Prague Czech Republic is a modern hotel set in a historical building from 1904. Guests will be able to use the onsite wellness spa that includes a pool and a Jacuzzi, and use of the Turkish and Finnish steam baths. They can use the onsite fitness center, and dine at the onsite eatery as well.